Packaging is essential for keeping food products safe for consumption. It primarily aims to contain the liquid product, prevent leakage and protect the contents from physical, chemical and biological hazards, which are present throughout the product’s shelf life. In the case of coconut liquid products, the choice of packaging is important in ensuring product quality and use. The most suitable packaging material should only be chosen after careful consideration of the desired shelf life and end condition of the coconut liquid product. Packaging has a major role to play in preserving coconut liquid products, keeping them in a good and wholesome condition. This includes protecting coconut liquid products from microbial spoilage and chemical deterioration, which can be caused by exposure to moisture and air. More importantly, packaging must be able to fulfil the two basic aims of containing the beverage and preventing leakage. It should also protect coconut liquid products from physical hazards throughout its shelf life. The life span of packaging starts from the point of production and packing, to its disposal by the end user. Current consumer trends show a preference for a wide range of coconut liquid products available all year round in various package volumes. With increased urbanisation and busier lifestyles led by today’s consumers, packaged coconut liquid products are fast gaining acceptance. As a means of extending the product shelf life, packaging has become essential in ensuring that the product remains safe for consumption. There are several methods to sterilize packaging material. Essentially, there are three major sterilization processes used either individually or in combination. These processes are heat treatment, chemical treatment and irradiation. Heat treatment comes in two forms – dry and moist. Dry heat treatment involves the use of hot air in the absence of water molecules. On the other hand, moist heat treatment involves the use of steam, specifically pure gaseous water with no other gases present. In comparison, moist heat treatment is more effective than using dry heat. Nevertheless, both sterilization techniques depend on time and temperature factors. For moist heat treatment to reach temperatures high enough for sterilization to occur within seconds, steam is produced using pressure in a pressure chamber. Here, any air that enters the chamber with the packaging material must be removed to ensure that it will not interfece with heat transfer between the steam and packaging surface. Chemical treatment is often used to sterilize packaging material. Usually, the chemicals used are hydrogen peroxide (H2O2) and peracetic acid (PAA). Used in combination with heat to sterilize the surface of carton packaging material, H2O2 is effective against microorganisms and resistant spores. For rapid sterilization, high concentrations of H2O2 at high temperatures are required. PAA is a liquid chemical sterilant used for the sterilization of filling machine and plastic packaging material surfaces. Peracetic acid (PAA) is produced through the oxidation of acetic acid by hydrogen peroxide (H2O2). It is a frequently used liquid sterilant that is effective against spores. Irradiation can be carried out using pulsed light or ionising radiation. In the case of pulsed light, short high power pulses are emitted by a capacitor that stores electrical energy. These pulses are intense and emit broad spectrum white light that sterilizes aseptic packaging material. A few flashes within a fraction of seconds provide high level microbial inactivation. lonising radiation can sterilize the interior of a sealed empty container with gamma rays. This is suitable for packaging materials which cannot tolerate thermal sterilization, or is restricted by their shape and cannot be conveniently sterilized by other methods. A radiation dose of 25kGy (2.5Mrad) or more is usually applied to ensure sterilization. In the case of the bag in box, an empty, sealed bag is irradiated and placed in a sterile filling chamber. The bag is unsealed, filled and resealed in a sterile environment to prevent any recontamination. Widely adopted to sterilize food packaging, electron beam technology works by focusing a controlled beam of electrons onto the surface of the packaging material. As the packaging material runs through the filling machine, the beam kills any bacteria or micro-organism present, thereby sterilizing the packaging material. Note that the product is not sterilized with the electron beam, only the packaging material is. Compared to chemical treatments, this packaging sterilizing technology allows easier water recycling as there is no need to filter out H202. Electron beam technology can also improve the environmental performance of the filling equipment by reducing energy consumption. Coconut liquid products are packed to maintain quality under various shelf life conditions. These conditions vary according to raw material quality, processing parameters, storage conditions and the threshold of acceptance by the individual consumer. Note that the packaging can protect the coconut liquid product, but cannot improve its quality over time. When selecting the most appropriate packaging for coconut liquid products, the following factors should be considered. Coconut liquid products might contain potential delaminators like free fatty acids or other flavours and stabilizers. For example, in some carton laminates, there may be occasional problems caused by free fatty acids or other components of the coconut liquid product. This is true for coconut milk based liquid products which either contain or will develop free fatty acids that react with some packaging material and cause delamination. Free fatty acids and other components found in the coconut liquid product can also attack some laminates and not others, due to the difference in layer properties. Referring to two Tetra Pak laminates in Figure 13.1, the free fatty acids may react with Tetra Brik® Aseptic/m polyethylene and aluminium foil adhesion to create a bag in box. This occurs when free fatty acids attack the bond between the inside layer of the inner polyethylene and the aluminium foil. If the package used for the coconut liquid product is Tetra Brik Aseptic/m, the attack is often rapid and may result in the complete delamination of the inner polyethylene from the aluminium foil. As a result, the inner polyethylene may be detached from the package and look like a ‘bag in box’. This significantly increases the oxygen migration surface. On the other hand, bag in box does not occur in the other type of laminate (Tetra Brik Aseptic/j). 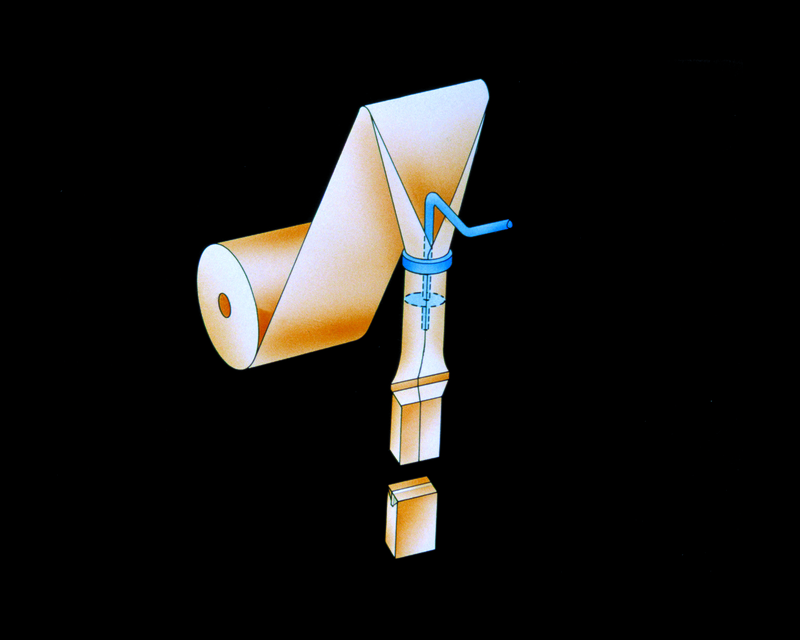 In the Tetra Brik Aseptic/j material, the inside polyethylene layer next to the aluminium foil is made from a modified polyethylene containing a high level of acrylic acid. The acrylic acid results in stronger binding with the aluminium foil. However, if free fatty acids are present, they will inevitably migrate through the polyethylene and, in time, the acrylic acid bond will be replaced by the free fatty acid molecules. The level of acrylic acid in the adhesive layer of Tetra Brik Aseptic/j is set to provide reasonable resistance against delamination by free fatty acids in ambient conditions over normal shelf life. In another example, coconut liquid products may also have a suspension of very fine powder, especially if it is recombined from coconut powders. Such powder particles may affect the transversal seal. Therefore, it is important to understand the biochemistry of the product and its ingredients, in order to suitably determine the choice of laminate. Quality parameters, such as flavour, colour and microbiological quality changes may be caused by several factors. Some of these are subjected to the flavour transfer within the package, as well as the entry of oxygen, light or microorganisms into the package. As such, the packaging requires barriers to deter these factors from entering the coconut liquid product. In the case of carton laminates, the aluminium foil layer within the laminate can provide most of the barrier required. Depending on the length of the shelf life, the packaging material is required to protect the coconut liquid product for an extended time period. Note that the expected shelf life is highly dependent upon the quality of raw material used, processing parameters employed and the consumer’s threshold of product acceptance. Storage conditions, specifically time and temperature, can affect the quality of the coconut liquid products. As storage conditions are subjected to changes, no one packaging system can completely prevent quality changes from taking place in the product. 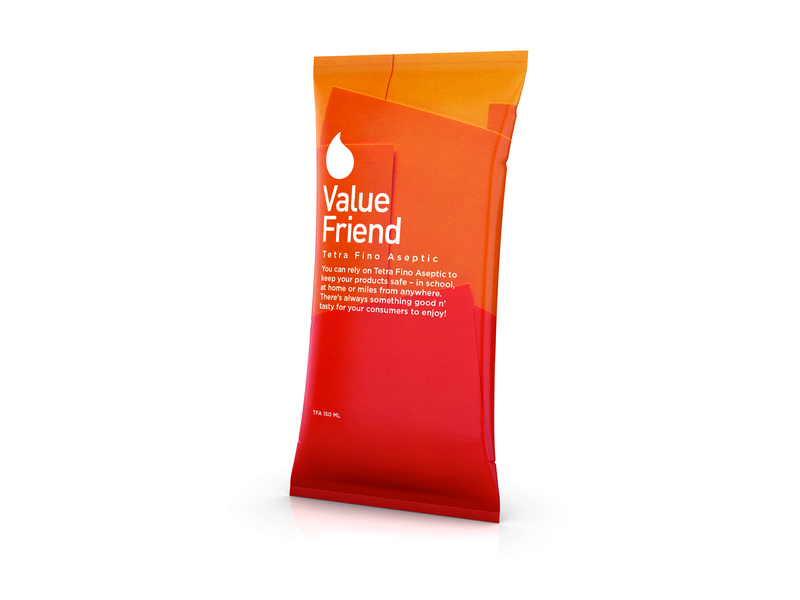 A packaging with the right protection for the product, coupled with the right price, design and messaging, can appeal to your target market. This will increase the likelihood of consumers reaching out for your unique branded product through various distribution channels. 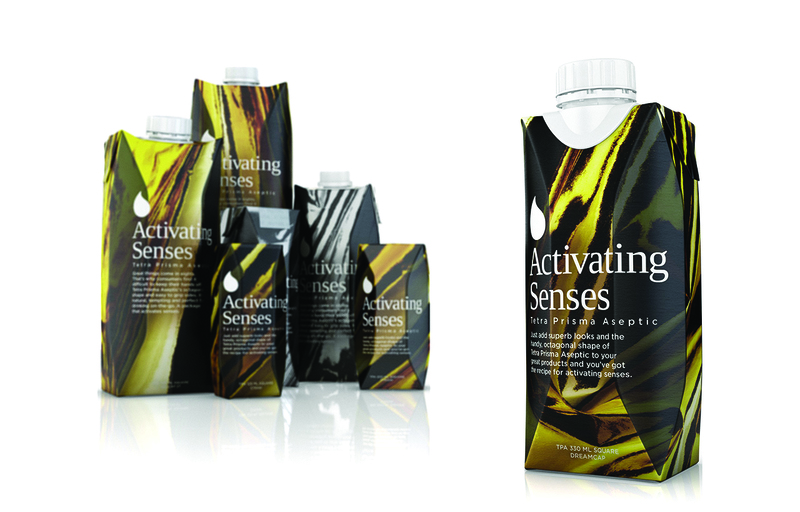 Besides protecting the coconut liquid product, packaging also acts as a communication medium to consumers. It is useful in conveying information to consumers. These information include the date of manufacture, expiry dates, nutritional information, ingredients and certifications (e.g. Kosher, Halal, Organic) according to each country’s food law regulations and requirements. 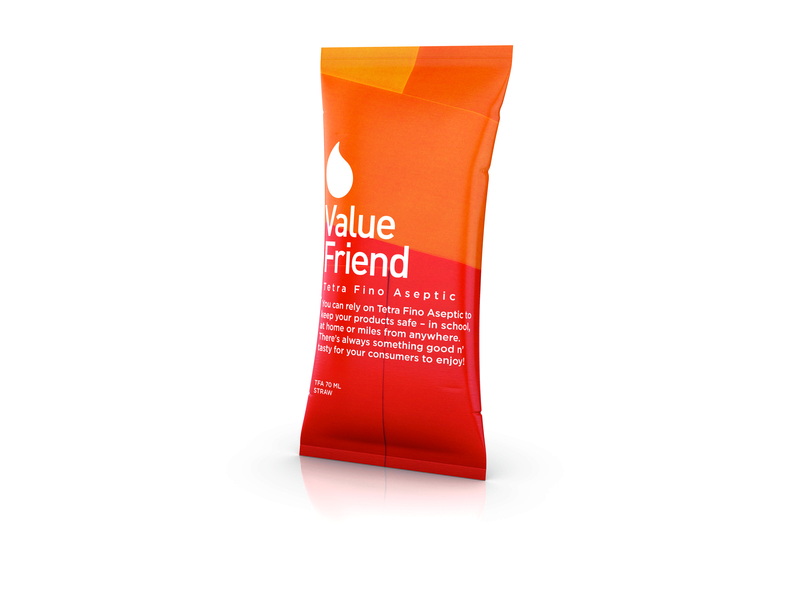 Packaging also helps draw consumers closer to the product and brand by communicating your brand personality through the logo, graphics and stories. Packaging comes in different sizes. Where consumption is in small volumes, portion packages (less than 600ml) are generally suited for children and adults to finish coconut beverages in one seating. These portion sizes are also suitable for packaging coconut milk or cream, as these products are typically used in small amounts in different food recipes. Where consumption is in large volumes, family packages and large size containers are typically bottled in 1000ml to suit in-home consumption of coconut beverages, as well as for hotel, restaurant, café or catering (HORECA) usage of coconut milk. In aseptic packaging, commercially sterile liquid products are filled into sterile containers under sterile conditions. These containers are then sealed to prevent re-infection. Compared to non-aseptic packaging, aseptic packaging allows the use of containers which are typically unsuitable for in-package sterilization. Through a thermally efficient high temperature, short time (HTST) sterilization process, aseptic packaging results in superior quality products, as compared to those processed at lower temperatures for longer times. This extends the product shelf life at ambient temperatures. For coconut liquid products, aseptic packaging can help distribute and store these perishable goods without refrigeration for more than six months. The aseptic packaging system achieves room temperature shelf stability by filling a sterilized package with sterilized coconut liquid products, all within the confines of a hygienic environment. This is different from other systems that use preservatives and refrigeration to prolong the product’s shelf life. For storing coconut liquid products at ambient temperatures, it is important that these products are commercially sterile when packed, and not re-infected by a contaminated packaging material. Therefore, it is important that the packaging material is properly sterilized, providing an effective barrier against external microorganisms. Different packaging systems are used for packaging coconut beverages, milk and cream. For pasteurized and extended shelf life coconut liquid products, non-aseptic packaging material and systems are preferred. In the case of long life coconut liquid products, aseptic packaging is essential. The choice of packaging material used is influenced by the product characteristics, the cost of both the product and the packaging, as well as consumer preferences. For many decades, aseptic packaging has been widely used in Europe and Asia. It was only introduced to the United States in the early 1980s. The most commonly used consumer package for aseptic products is the laminated carton. The aseptic packaging system fills the sterile product in an aseptic manner, and hermetically seals the package to ensure that sterility is maintained during handling and distribution processes. Commercial requirements of less than one faulty package out of 10,000 packages produced are common. There are five major categories of aseptic packaging equipment available. In most countries, laminated carton packages are the predominant form of packaging for coconut liquid products. Most of these are aseptically packed. Non-aseptically packed coconut liquid products using chilled distribution can also be found. The material used in carton based aseptic packages is normally made up of a barrier layer, and layers of paperboard coated internally and externally with polyethylene rendering. It is impermeable to liquids. Today, the most commonly used material for the barrier layer is the aluminium foil, which acts as a barrier to oxygen, flavour and light. Other barriers include SiOx on polyester, ethylene vinyl alcohol (EVOH) and polyamide (PA). The structure of a typical paperboard carton is shown in Figure 13.2. The polyethylene coat on the outer layer protects the carton against environmental moisture, while the paper layer provides stiffness and strength. Another layer of polyethylene bonds this base paper to the barrier layer, which protects itself against the entry of light, gas and other materials. 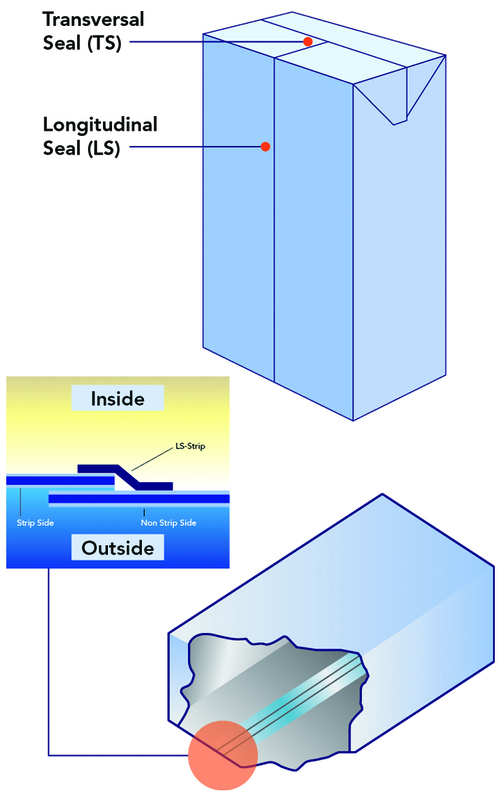 The last inner layer of polyethylene acts as a sealing (Figure 13.3). For proper functioning, the packaging material should be stored at the temperature and humidity levels recommended by the manufacturer. A pre-fabricated system produces pre-fabricated cartons such as the gable top. First, blanks are die cut and creased, while the longitudinal seal is completed at the packaging material plant by skiving the inner layer of board and folding it back. These blanks are delivered to the beverage packaging facility in lay flat form for shaping and bottom sealing. In the extended shelf life (ESL) application, the hygiene area of the filling machine consists of several separate functional zones where operations are carried out in sequence. Hygiene is maintained in each zone by a slight overpressure of sterile air. The inside surface of the carton is disinfected with hydrogen peroxide (H202) solution delivered either as a fine spray or as peroxide vapour in hot air, so that the vapour condenses as liquid peroxide on the carton surface. The peroxide is then removed by a jet of hot air. After filling, the top seal of the carton is folded and closed. A prefabricated blank is shown in Figure 13.4. Carton-based packages produced from rolls are pre-printed and pre-creased. 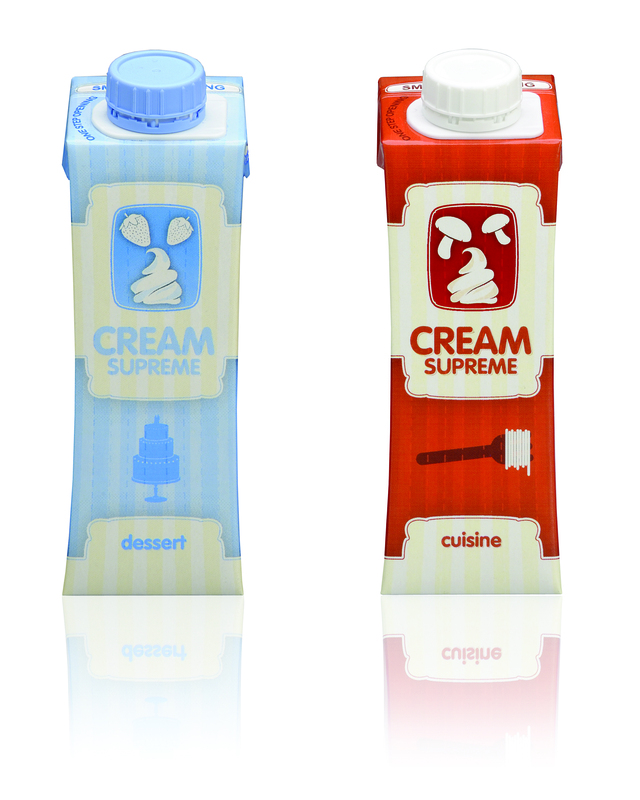 They are respectively known as Tetra Brik® and Tetra Prisma® packages from Tetra Pak. First, the packaging material is sterilized using a wetting system or a deep bath system. The wetting system involves the application of a thin hydrogen peroxide film containing a wetting agent. In the deep bath system, the packaging material is fed through a deep bath containing hydrogen peroxide. Next, the sterilized material is fed into a machine where the material is shaped into a tube and the longitudinal seal is secured by heat sealing. A strip that had been added prior to sterilization is heat sealed across the inner surface of the longitudinal seal to prevent contact between the outside and inside of the carton. It also provides protection of the aluminium and paperboard layers from the product, which could corrode or swell the layers if such a strip were absent. After the longitudinal seal is formed, the coconut liquid product is then filled into the tube and a transversal seal is made below the level of the product to ensure that the package is completely filled. The sterilization, filling and sealing processes are performed inside a chamber that has undergone sterilization prior to production and is maintained at an overpressure of 0.5 atm with sterile air. Some carton-based packages made from rolls are shown in Figure 13.5. 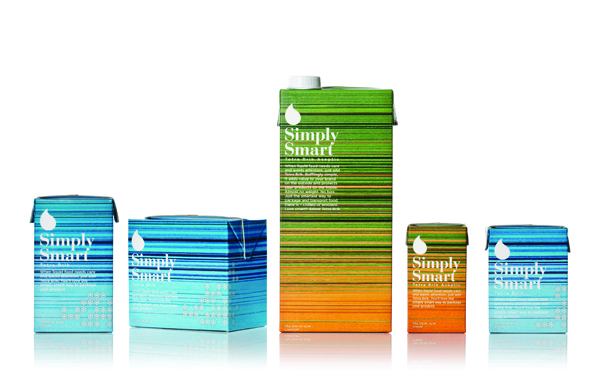 Another type of carton-based package from Tetra Pak is Tetra Top®, which is a carton package with a polyethylene lid. It is usually made from roll-fed packaging material. The packaging material is folded in the machine, sealed longitudinally and cut into sleeves. The plastic tops are injection-moulded and applied to the packages. After filling, the bottoms are sealed by heating elements. Besides laminated carton packaging, coconut liquid products can also be packaged using plastic pouches and bottles, glass bottles and metal cans. Different types of plastics can be used to bottle coconut liquid products. Over recent years, blow moulded plastic bottles made from high density polyethylene (HDPE) or polypropylene have been commonly used. Sometimes, pigments are added into these materials to act as a light barrier. Multi-layer plastics with improved barrier properties have also been developed. High-density polyethylene (HDPE) is a member of the polyolefin group produced through an extrusion blow moulding (EBM) process. As a highly crystalline material, it boasts high impact strength, chemical resistance and thermal stability. most common barrier layers are ethylene vinyl alcohol (EVOH) and polyamide (PA), which allow ambient storage of beverages for more than six months. HDPE bottles are also fairly opaque and often pigmented. In general, HDPE provides reasonable barrier properties, a stiff and strong structure, good resistance to chemicals and moisture, and is easily processed and shaped. Polyethylene-terephthalate (PET) bottles are made by stretch blow moulding using a preform. They are colourless and transparent, although pigments can be introduced. A preform is an injection moulded PET tube closed at one end while a finished neck is formed at the open end. When blown, the stretching gives tensile strength and gas barrier properties to a lightweight bottle that is relatively low in cost. For coconut liquid products which contain a high concentration of polyunsaturated fatty acids that can be rapidly oxidized, plastics that are minimally permeable to gases are highly preferred. A PET bottle is more robust than glass but is more gas-permeable. Barrier properties for PET bottles improve with increased crystallinity, which is in turn, influenced by material thickness and conditions during stretch blow moulding. Barrier improvement is also possible through the introduction of new compounds, a barrier coating or making several material layers using a preform. For aseptic filling, PET bottles are first sterilized before the coconut liquid product is added. During sterilization, bottles are treated with hydrogen peroxide or a mixture of hydrogen peroxide and peracetic acid, then rinsed with sterile water. They are usually of lower weight than hot fill bottles and do not require heat setting. As a result, they are cheaper and more flexible in design. Glass bottles can be used to contain coconut liquid products with hot or aseptic filling techniques. It is produced using the blow and blow, or press and blow method. Over the years, glass has developed into a sophisticated form of packaging. Scuff resistance has been increased through light weighting and surface coating, while plastic coating materials are also used to coat glass. This plastic coating acts as a surface protector and pre-label base, helping to absorb impact, reduce noise and provide insulation. Glass bottles also come in new “wide-mouth” versions with easy-to open caps. These are generally produced by the press and blow method. To make good glass bottles, attention must be given to the quality and strength of the glass material during production. These include raw materials silica sand, soda ash, limestone, dolomite and cullet. After mixing, the raw materials are charged into a melting furnace and refined before being forced through an orifice, emerging as a gob of molten glass. Then, it goes into a forming machine, to be turned into the shape of a bottle by compressed air. Flexible pouches are categorized as wholly plastic or plastics, fibre and aluminium combinations. Plastic pouches are usually made up of five layers, one tie layer connects the printed polypropylene to a proprietary centre barrier, which acts as a gas and water barrier. Another tie layer comes before an inner polyethylene sealant layer. A plastic pouch is light and stands by itself. It also allows direct printing onto the package. Sometimes, spouts made out of high density polyethylene are also attached. However, as the spout can compromise the space inside the pouch, straw holes can be used instead. Alternatively, a flexible pouch of plastic, fibre and aluminium combination with no rigid geometrical shape can be used (Figure 13.6). Tetra Fino® is made up of six layers. It has no rigid geometrical shape and may have openings like straw holes. Typically, three-piece cans are two parts made of steel while the third part is fitted with an aluminium easy-open end. Both parts in the three-piece can are soldered, welded or side-seam bonded by adhesive. For two-piece cans, there is an integral body and bottom fitted with an aluminium easy-open end. A three-piece can is made by printing and base-lacquering sheets of tinplate, which are then cut into rectangular shapes of the appropriate size. These rectangles are first shaped and soldered. Using either two or three piece metal cans, coconut liquid products can be heat sterilized with their beverage contents. Next, lacquer side-stripes are applied over the internal solder margins. The cylinders formed are then flanged at both ends. Depending on the diameter, manufacturers can help to fit the steel or easy-open end. Finally, the open-topped cylinder is sprayed with a second coat of lacquer. To reduce the cost of producing the aluminium end, ‘necking-in’ the can’s body can be adopted to reduce the diameter of the end. The production process of a two-piece can consists of a few stages. First, the cup-maker machine converts the coiled feedstock into circular discs. Then, they are held in a controlled die gap and drawn or pressed into the required cup shape. Next, cups received from the cup-maker are redrawn to the basic can diameter and progressively forced through car-bided ring discs and stretched to the desired can length. In this process, can wall thickness is reduced by up to 70%. Last but not least, a doming punch at the end of the stroke produces a bottom configuration to suit design requirements. Cans are then necked in and flanged in a special machine, covered with two coats of lacquer sprayed onto the internal surface of the can. 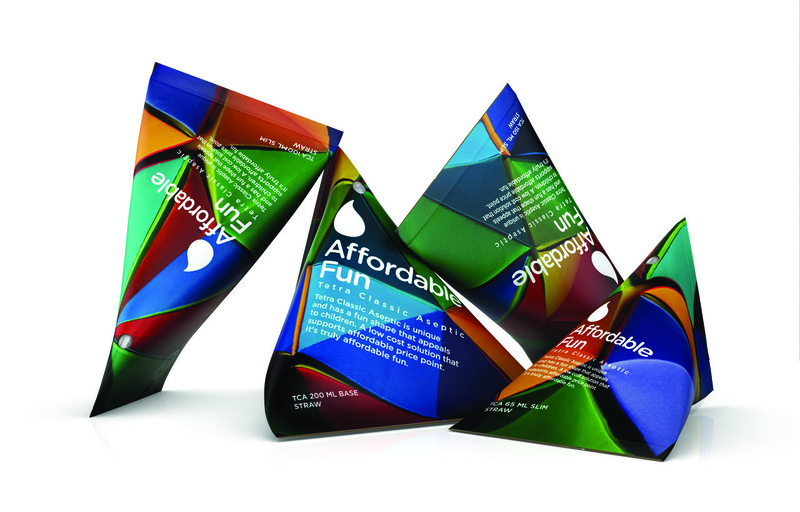 Innovative packaging designs can help products stand out on the shelves. Typically, coconut liquid products can be packaged in five different carton formats. 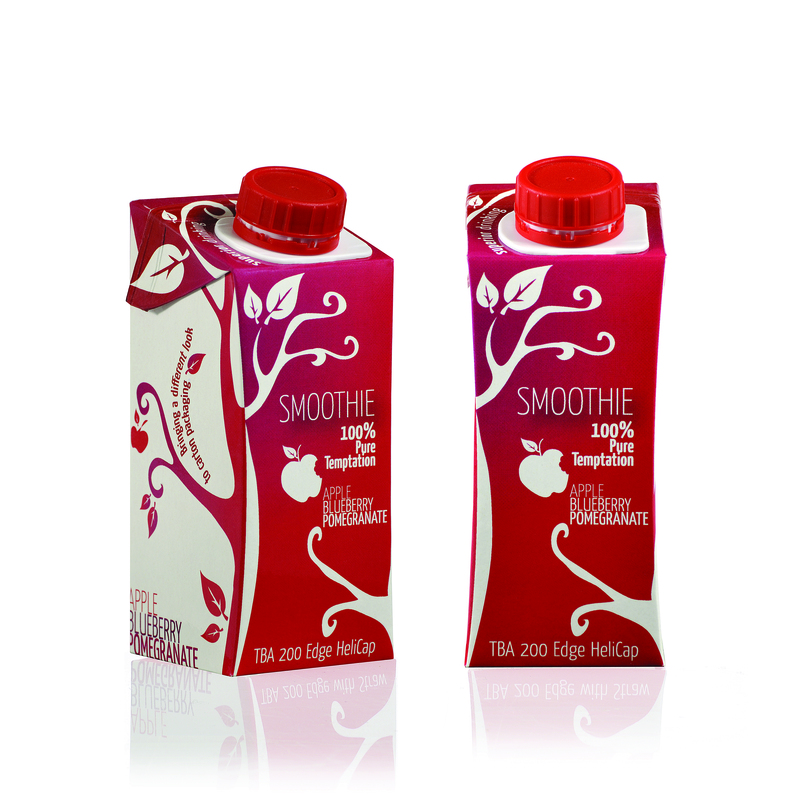 In addition, there are six other formats of cartons from Tetra Pak to choose from. A familiar portfolio to consumers worldwide, Tetra Brik® Aseptic is the world’s best-selling carton package range for liquid food. Easy to distribute, stack and store, it is available in volumes ranging from 80-2000ml. Available in fun, unique shapes, Tetra Classic® Aseptic also appeals to consumers with its easy to squeeze and drink mechanism. From the kitchen counter to the school desk, this packaging stably contains liquids everywhere. 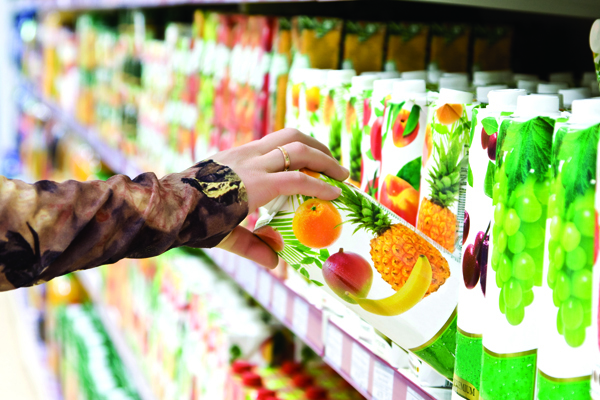 Tetra Prisma® Aseptic offers a distinctive prismatic shape that instantly stands out on the shelves. Its eight-sided shape, with metallized and non-metallized print options, provides unlimited creative branding opportunities. In addition, it is designed to naturally fit in your hands, ensuring a good grip with easy opening and pouring functions made easy with smart openings and convenient caps. Tetra Fino® Aseptic is made easy for everyone. Retailers will find this format easy to pack, stack store, promote and replenish. Likewise, consumers can easily carry and store these products at home. Last but not least, they are child-friendly, made easy for children to hold. Commonly found in the refrigerated sections of retail channels in the United States, Europe and Oceania, Tetra Rex® is a chilled package designed to protect fresh products where chilled distribution is established. Offering a broad portfolio of packages and closures, this format is also customisable based on the choice of board, barrier and print. Typically, coconut liquid products can be found in the above mentioned packaging formats. Shelves can also be refreshed with newer formats like Tetra Brik® Aseptic 200 Slim Leaf, Tetra Brik® Aseptic 250 Base Crystal, or made more appealing with convenient formats that have added caps like Tetra Brik® Aseptic 250 Edge Helicap23, Tetra Gemina® Aseptic and Tetra Top®.